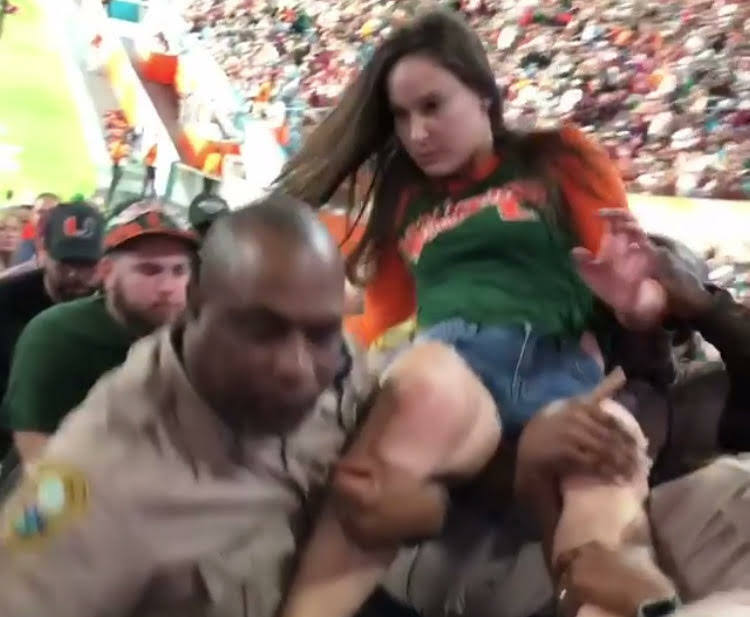 While the Canes football team was busy gathering the eyes of the nation on the field against Virginia Tech, one woman and a police officer took over the internet for an incident in the stands. The woman seen in a viral video fighting with a Miami-Dade officer has been identified. In this exclusively-obtained mugshot, you can see 30-year-old Bridget Freitas. She has been charged with battery on a police officer and disorderly conduct. In the 14-second clip, four officers are seen trying to remove Freitas from section 129 at Hard Rock Stadium. Before the incident with cops, Freitas was arguing with other fans and using profanity, police sources say. As the officers tried to walk Freitas out, she refused and sat on the stairs, sources say. The cops ended up lifting her up and carrying her out against the railing. At the point, Freitas is clearly seen taking a swing and slapping one of the officers. The officer retaliated by hitting her in the face. A police source says the officer did so to gain compliance. According to several reports, Miami-Dade Police Department is investigating the officer-involved incident. Freitas bonded out of jail early Sunday morning. Newer PostEXCLUSIVE: Dolphins fan claims she was ejected after kneeling during anthem, saying "a-hole Trump"